Looking for an alternative to your stock fuel cell cap or maybe you need a fill cap for that custom oil tank or valve cover you are building? Well, look no further! 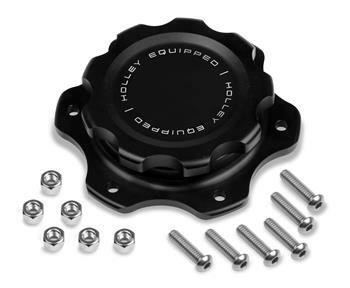 Holley has created a full line of Billet Fuel Cell Caps and Billet Fill Caps. Holley caps are CNC machined from 6061-T6 billet aluminum and they feature a bright black anodize for great looks and corrosion protection. Each cap features a laser etched Holley Equipped logo so you know it is quality product. The Holley Billet Fuel Cell Caps are available for Jaz, Harwood, or RCI fuel cells. The 241-226 kit features a 4.438” 6 bolt flange and has a large 3” opening with an easy to grip screw on cap that utilizes an O-ring seal. Stainless steel hardware is included for an easy installation.